I began collecting royal memorabilia in the early 1970s. My first “purchases” were actually gifts from my parents. We had wandered into a little store, “Trash and Treasures,” in the French Quarter of New Orleans, where my reluctant parents paid for a small mass-produced tumbler from the 1937 coronation of King George VI and Queen Elizabeth, later known as the Queen Mother. The other purchase was a teacup with matching saucer and plate, commemorating the coronation of Elizabeth II. It too was a mass-produced item, with a poor decal of the new queen in a riding habit uniform (probably worn at The Trooping the Colour during her father’s reign). Both purchases were probably overpriced, but for my parents it was an investment in family harmony. Given my interest in the British Royal Family and the fact that I fell in love with Diana Spencer the first time I saw her, it was only natural that I would begin collecting Diana-related memorabilia. I refer to this collection as “Dianaana.” My Diana collection began with Diana’s early appearances in People magazine and the book Invitation to a Royal Wedding. 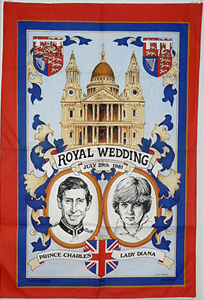 It later grew to include several of the many items mass produced for Diana's wedding in 1981, as well as a few of the commemorative items produced in 1997 and later. My favorite pieces had to be a red powder compact with powder still intact, decorated with the Prince of Wales’ crest, and a Charles and Diana linen tea towel (allegedly when Lady Diana thought about backing out of the wedding, her sister told her that it was too late because her face was already on the tea towels). Why would anyone want to collect items about the late Princess? The reasons are probably as varied as the collectors themselves. Some people look at collecting as an investment in the future. Others like the thrill of the hunt, the challenge of looking through an entire flea market for the perfect thing. Some collectors want to be reminded of the “good old days” and happy times. And some collectors, including me, are probably just captivated by the Princess, with her beauty and her humanity, her vulnerability and her flaws. Diana admirers can grow collections to suit any budget. Collectors should be warned that they are unlikely to see a significant return on their purchases unless they concentrate on the more expensive and limited-edition items or items desired by collectors in another field (cross-over collectibles). For example, commemorative Wedgwood pieces are desired by both Diana collectors and Wedgwood collectors, thus increasing the prices for these pieces. As a general rule, collectors should only collect the items they like, not try to collect as an investment. From my observations of eBay and articles I have read, items produced after the Princess’s death in 1997 have not increased in price and some have actually decreased. Among these are the numerous items produced by the Franklin Mint in the United States, including plates, music boxes, and dolls with separately packaged clothing. The Franklin Mint items were highly publicized after the Princess’s death, and some (such as the dolls and ensembles) were sold by subscription only, creating a rush among buyers. This caused me some anxiety because I desperately wanted the doll and clothing but was unable to make the significant monthly commitment to purchase the complete set. However, the Franklin Mint items, including the dolls, are sold on eBay every day at prices equal to or less than their original sale prices. The only exception to the static value of the Franklin Mint items are the dolls and clothes which have been kept “mint” in their original boxes and packaging. “Mint” means that the items have never been removed from their boxes, a standard which would be difficult for most Diana collectors to preserve. After all, if you have a lovely Princess Diana doll, wouldn’t you want to dress her in those beautiful and memorable clothes? For collectors with less money to invest, there are many items available. Some of the most popular inexpensive items are magazines and books, postcards and posters, and postage stamps. Princess Diana publications can be found anywhere, particularly in used bookstores, antique shops, flea markets, and the Internet. It is possible to find interesting books discarded at local libraries for a reduced price. I noticed immediately after Diana’s death that early books, dated 1992 and earlier, tripled in price at my local used bookstore and antique shop. Those books did not sell at the inflated prices, and merchants in my area have reduced their prices to a reasonable level. Unfortunately for speculators, Diana books will probably follow the rules that govern the general sale of books – used books don’t appreciate in price unless they are first editions, have been signed by the author or Diana, or have some other rarity associated with them. 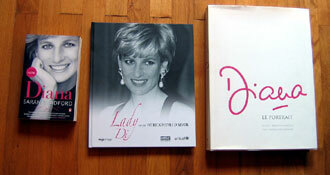 The priciest books related to Diana are those few she signed for the auction of her dresses. On 22 August 2007, I checked eBay and found that two unsigned copies were being auctioned. An American seller had a paperback copy available, and the only bid was $200.00. An English seller had a rarer hardcover edition for sale, and eleven bidders were vying for it; the current price was £255, below its reserve price. Any serious collector of Diana books should own both the 1992 edition of Andrew Morton’s Diana: Her True Story and the revised edition from 1998, and possibly also Jonathan Dimbleby’s 1994 biography of the Prince of Wales. The 1992 edition of Diana: Her True Story finally revealed the depths of Diana’s unhappiness, and the Dimbleby biography was Charles’ rebuttal. The revised Morton edition in 1998 surprised some of us with the revelation that Diana herself had been Morton’s informant. These three volumes chronicle the rocky beginning and the dismal end of this royal marriage, from the viewpoints of Diana and Charles and their loyal and not so loyal followers. Another book of interest, which may be unknown to British collectors for legal reasons, is Wendy Berry’s The Housekeeper’s Diary. Mrs. Berry, who was the housekeeper at Highgrove, was one of the first to know that the Wales’s marriage was disintegrating as she looked after Diana and Charles's special guests, James Hewitt and Camilla Parker Bowles. Another area of low-cost collectibles is art. Many admirers of the Princess have printed or drawn images of her. Some have even sold posters or silk screens based upon their original artwork. The value of these pieces varies widely, as does the ability of the artists. Once again, the rule is that collectors should buy what they enjoy. On 22 August 2007, two pencil drawings of the Princess were available on eBay and the beginning bids ranged from $3.50 to $35.00. On the same day three paintings were available: an attractive painting had a single bid of $45.00, a Chinese-produced reproduction of Warhol’s representation of Diana in her formal engagement photograph had no bids at $9.99, and Diana in her Elvis dress had no bids at a mere $18.99. Collectors may also find unframed posters of Diana or relating to Diana. I purchased two of my favorite items, posters of some of the auctioned dresses, at the Dresses for Humanity Tour in Omaha, Nebraska. Framing and mounting the posters cost much more than the actual posters, which were beautiful. Stamps are another low-priced collectible available to most of us. Collectors should try to find stamps in both mint (non-canceled) and used condition, as well as first-day covers. Stamp shops may have beautiful single stamps, sheets of stamps, as well as covers featuring Diana. At one collectibles show I found two sheets of Diana memorial stamps, both matted and framed, at a very reasonable price. One of them featured Diana wearing several of the Christie’s dresses. Some of my favorite local finds were single stamps which had been made into decorative pins. More ambitious collectors can find large albums featuring first-day covers of stamps issued for the royal wedding in 1981 by Great Britain and the countries of the former British Empire. One of the largest areas of my collection consists of commemorative plates, cups and beakers, and other china. Commemorative royal china has a long history in England, going back to at least 1688. A huge number of commemorative china pieces were sold in 1981. The quality of these items varies widely, but unless they were made by a famous company such as Wedgwood, prices have remained reasonable for the collector with a small budget. In addition to 1981, other pieces were issued in 1982 and 1984 to commemorate the births of the young princes, in other years to mark royal tours, and again in 1992 and 1996 to mark the official separation and divorce. 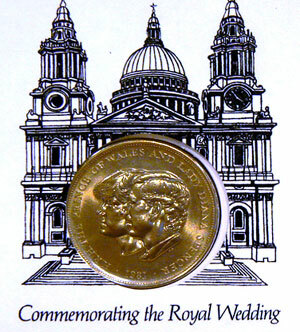 Then in 1997 there was the flood of commemoratives to mark Diana’s death. A final area of collecting, that will vary widely in price, is photography. A few years ago I purchased some photographs of Diana and Ken Wharfe, taken by an amateur photographer. The photos were fairly inexpensive, and I have enjoyed them very much. However, purchasing photographs can cause problems for the collector. Unless the purchase includes the copyright to the image, the collector does not have the right to reproduce the photographs without permission, and credit must be given to the photographer if the photographs are used. In my case, if I chose to post the photos on The Royal Forums, I would have to ask the photographer's permission to do so. In addition, I could not use those photographs for personal profit. Copyright laws can be difficult to understand, but the collector must know that using another person's photograph is like plagiarizing an author's book. Unless the purchase contract specifically includes the copyright, the collector has not bought the copyright and should be cautious about the use of photographs. eBay has hundreds of photographs of Diana available, some of them "signed" (almost always a facsimile signature). Collectors can buy and enjoy them, and these photographs should not be expensive to acquire. If the item is "signed" or "autographed," unless it comes with provenance, the collector should expect these items to be facsimiles and NOT genuine autographs. Where should collectors look for new pieces? Obviously, royal collectibles are most readily available in Great Britain and the Commonwealth. For Americans it can be more difficult. If collectors have the chance to travel abroad, adding to their collections should be a priority. Antique shops, flea markets, and "car boot sales" are great places to start. If friends or relatives go abroad, collectors should tell them what to look for (and what to expect as a reasonable price). For the American collector who has to stay at home, it can be profitable to look in antique shops and malls, flea markets, garage sales, and auctions. I have found some good pieces at small auctions and a few more items listed in local newspapers. The problem with buying locally is that unless you can find a reliable and complete price guide, it is very difficult to determine what is a good price. If two emotional collectors appear at the same auction, they can goad each other into exorbitant bids (so you may have to eat tuna sandwiches for a few weeks, but you got the commemorative teapot!). 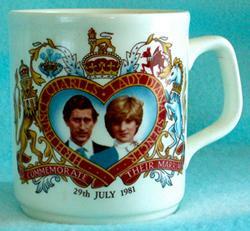 There does not seem to be a recent reliable and complete guide for Princess Diana memorabilia. In the early 1990s I owned a guide to royal memorabilia, but it had only a small section about the Princess. Obviously, the number of collectibles has grown since then and values will have changed. In 2000 Charles Nobles issued his Diana: Collecting on a Princess. I bought a copy but did not find it very useful. I recently discovered that there are two guides relating to Princess Diana items on eBay (which may be located under the "Reviews and Guides" section). One gives a detailed discussion of the history of the dolls and various makers, including the Franklin Mint controversy and the possibility of a Diana "Barbie doll" issued by Mattel; the other is about the sale of replica gowns for the Franklin Mint doll. Neither guide discusses prices, but collectors may enjoy reading them. Without a reliable price guide, collectors should look for dealers of royal memorabilia and browse eBay. In my opinion eBay is probably the best place to study the value of these collectibles. eBay is a competitive market. It is possible that several dealers will have the same item available, lowering the price. (Here in Des Moines, Iowa, few sellers stock royal collectibles so it is a sellers' market.) On the other hand, a collector may be competing against many other Diana collectors or cross-over collectors. eBay is the essence of "supply and demand." Even if the collector is not bidding, the eBay listings are a wonderful opportunity to study the market. But most collectors will find eBay irresistible, with the unlimited opportunities to find new pieces in any price range. Purchasing on eBay does have its drawbacks. The collector cannot examine the item in person and must rely on the seller's photographs or descriptions. It may take several weeks before the item arrives in the mail. The collector also relies on the merchant's honesty when assuming that the item will be sent as promised. (I have only had one problem with a memorabilia dealer not sending my purchase.) Packaging and treatment of the item by the postal service is another consideration. Collectors should consider purchasing insurance against breakage and loss. Postage and insurance should be considered in the total price. It may not be a good investment to have an item mailed, particularly from overseas, if insurance and postage are more expensive than the item itself. eBay can be overwhelming for the inexperienced collector. If the collector types "Princess Diana" in the Search field, thousands of items will be listed. (There are hundreds of photographs, postcards, and postage stamps listed.) I have found that the easiest way to sift through the list is to find an item similar to what you are searching for, pull up that item, and then search for items related to it. For example, plate collectors might see a plate they like, click on that listing, and see the description. In the top part of the screen, just over the item listed, are these prompts: Collectibles, Historical Memorabilia, Royal Memorabilia, and Other. 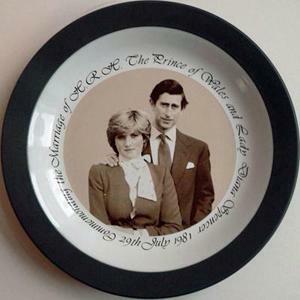 Click on "Royal Memorabilia" and type in "Princess Diana plates" or, for a wider listing, "Princess Diana." It is also a good idea to search for "Princess of Wales." Once the collector has a good list, the items might be sorted according to price (highest or lowest), date the item was listed, or date the auction ends. I like to sort according to the highest price, some of which are items with high opening bids (and no current activity). It is also interesting to see which pieces are highly desirable. My second favorite list is by auctions ending soonest. That allows me to see what the finishing prices are likely to be. Some of the items listed on eBay would be attractive to most collectors. Yesterday (22 August 2007) an auction for a Diana dress ended on eBay. The dress was the beautiful ice-blue Princess Grace-type gown and stole worn by Diana in 1987. She appeared in Cannes wearing this dress, allegedly shortly after she was told that Barry Mannakee had died in a motorcycle wreck. WE, the U.S. television network, had set an opening bid of $125,000 for the dress. Unfortunately, no one bid. In my opinion, even given the history of the dress, the opening bid had been set too high. Although it was a breathtaking dress, it was nowhere as famous as the "Travolta dress" or the "Elvis dress." But similar items, or other items owned by the Princess, do appear at auction or for sale from time to time. Collectors should be very careful when purchasing these items because their value is linked to the provenance of the item. Provenance is a fancy word that basically means "the history of this item." Who owned it? What is the story behind the item? In the case of the icy blue dress, the story behind it can be established. WE bought the dress at the Christie's auction in 1997 and carefully conserved it. The Princess donated the dress for the auction. The Princess was photographed several times wearing the dress. Inside the dress was Catherine Walker's label "Chelsea Design Co. Ltd."
As I write this (23 August 2007), there are several eBay items listed as being directly connected to the Princess. A faux pearl choker, given by the Princess to a friend who was director of a charity, along with a letter of authenticity from the charity, was listed at $499.95, with no bids. A signed photograph with a personal note inscribed, together with a certificate of authenticity, was being fought over by three collectors with a current bid of $425. (The signed photograph was a thank-you gift to a photographer who had accompanied the Princess and her sons to Thorpe Park on that famous outing.) A very sad Christmas card from 1992 was listed at $299. A diary given to Sarah Jane Gaselee (one of Diana's bridesmaids), inscribed and with an accompanying signed gift tag, was available for $5,000. Eleven bidders were competing for a lock of Diana's hair (and its certificate of authenticity); the current bid was $100.00. The 1992 Christmas card for sale was, according to the seller, one of the few genuine Christmas cards actually signed by the couple that year. As we all know, 1992 was the "annus horribilis" and royal customs were probably disrupted. (It seems that members of the Royal Family do actually sign their Christmas cards, in contrast to American presidents.) Authentic Christmas cards and letters from Diana do get listed for auction. Collectors should, however, treat signed photographs and autographs with caution. Most of these items, even with a "certificate of authenticity," are mere facsimiles. It would, in my opinion, be unwise to trust the authenticity of written items unless they are accompanied by envelopes, supporting documents, and good provenance. For example, many royal retainers (housekeepers, butlers, and others) have regularly received Christmas cards, and these items are sold when the retainers die or when they need to make money. In those instances, the purchaser can obtain good provenance. One dealer, the owner of the Sarah Jane Gaselee diary, has a huge collection of material available for sale on eBay or at her own site. Alicia Carroll has advertised her Diana memorabilia for sale in magazines for many years. Interested collectors can find her store online at www.everythingroyal.com. Ms. Carroll seems to have a talent for acquiring letters and other Diana items, including a bracelet that Diana gave to Sarah Jane Gaselee. Although some of the items described on-line have been sold, they make for interesting reading. One poignant 1984 letter was written to Betty Andrews, who worked for the Spencer family from 1945 to 1981, on official Kensington Palace stationery. Diana wrote about how much William adored his little brother. The letter is priced at $25,000.00. Ms. Carroll also has many Christmas cards available for sale. Unfortunately this wonderful site is in the process of closing down. However, collectors can find other online stores simply by searching for the keywords "royal collectibles." I have come across several other interesting online antiques sites, which include www.steptoesantiques.co.uk, www.antiquesofengland.com, www.glassmenagerie.com, www.glamorganantiques.com, among others. Collectors should remember to ask overseas sellers whether they ship abroad and, if so, how much shipping and insurance will add to the cost of their purchases. I hope you all enjoy the hunt for your Diana collectibles. If you have any questions, I would be happy to discuss them with you in this thread at The Royal Forums. Photos on page 1 taken by members of The Royal Forums and used with permission. Photo of commemorative mug taken by Flickr member Ennor and used with permission. Photo of commemorative plate taken by Flickr member Rink a dink and used with permission. Photo of "Elvis dress" doll taken by Flickr member BlueEyes5 and used with permission. 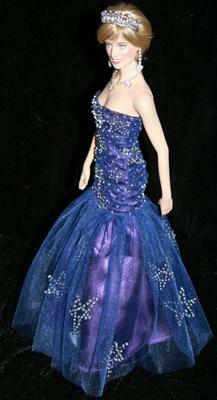 Photo of doll in blue dress taken by Flickr member Anita.N.-dolls-fashion-design and used with permission.